This guide covered most of the content on the internal Flex System V7000 and the Brocade FC5022 SAN Switch. If your Flex system came with an integrated v7000 use the following steps to create the v7000 cluster. After you have managed and inventoried your chassis you will see the integrated v7000. You will first be asked to provide the superuser password. You will then setup the system licenses you purchased. 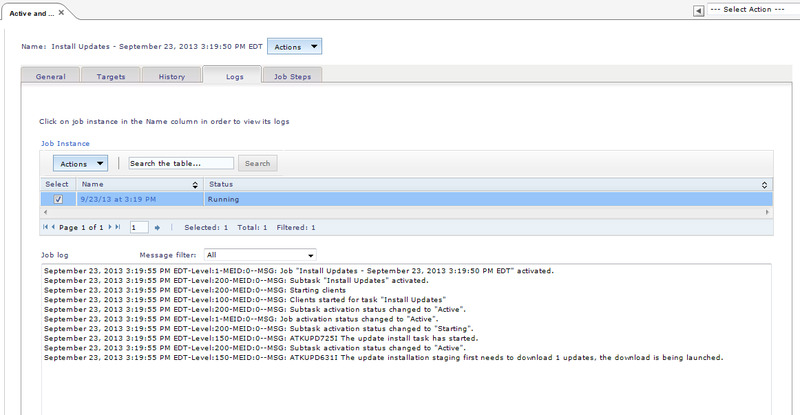 Next you can configure Email Notifications or skip this step till later. You will then add the enclosure. Next you will configure your RAID options for your internal storage. Once the cluster has been created you will be launched into the v7000 GUI. 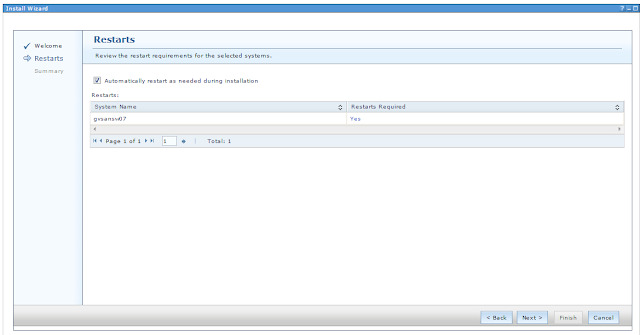 To setup the service and management IPs (if not already done within the CMM) go to Settings -> Network on the left pane. Once the GUI is setup you should see a screen similar to the one below. The IBM Flex System Manager can manage the following external storage units. To manage an external V7000 and SVC use the following steps. On the storage system you will need to change the superuser ssh key. Right-click on the superuser user and click properties. Click change SSH key and place the public key in the pair to the superuser users profile. 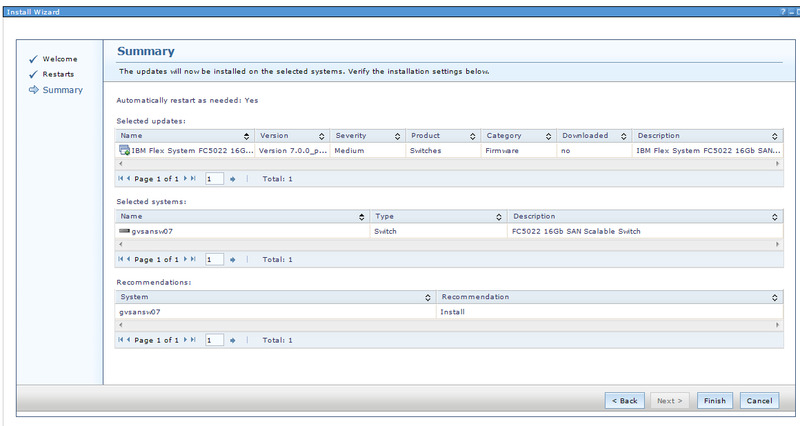 Once complete you should see the storage system as a managed device under the storage group in Resource Explorer. Managing the XIV is even simpler than the V7000 and SVC. You simply need the management IP address and credentials. You should see your storage systems managed and in an OK state as seen below. In this article I will show the steps to upgrade your Flex v7000 via the Flex Systems Manager as well as any caveats discovered. Click the warning link and it will bring you to the screen where you can choose your upgrade and click Install. During the wizard it will ask you to let the test utility run ; ALLOW THIS TO HAPPEN. The test utility is critical to ensure the update will be successful. The upgrade job will need to restart the storage system. However, this can be misleading since the v7000 is a dual controller system it will simply do one node at a time so you will NOT need to shutdown your hosts for the upgrade. On the summary screen, make sure all of the information is correct and then click Finish to launch the job and either schedule this job or run it now. Watch the upgrade and when it completes verify in the FSM under the v7000 node inventory or in the v7000 GUI that the upgrade completed successfully. not running the recommended firmware versions. version of microcode, then check for a later version of this tool. 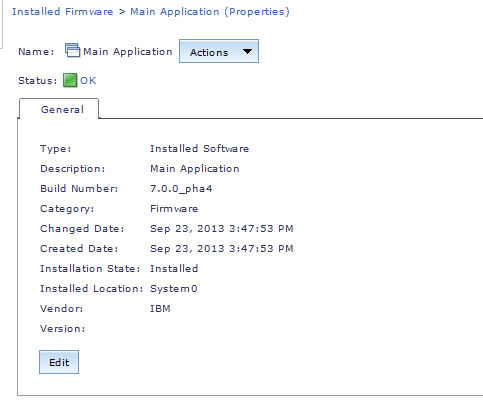 First go the IBM support and downloads and search for Flex v7000. Download the drive microcode package. Next either pscp or WinSCP the package to the v7000 the the /home/admin/upgrade directory. 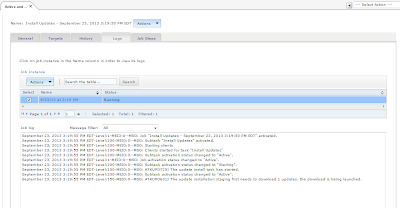 Then SSH to the v7000 and type lsdumps -prefix /home/admin/upgrade to see if the upgrade package is there. When every drive is updated try to run the update again. For this article I will be adding new 900 GB drives to my Flex Systems V7000 (internal to the chassis). We will be using RAID5 and the best way to group disks for performance is 8 disks to make an mDisk. An mDisk is a managed disk group or array of disks that can then be added to mDisk pools. 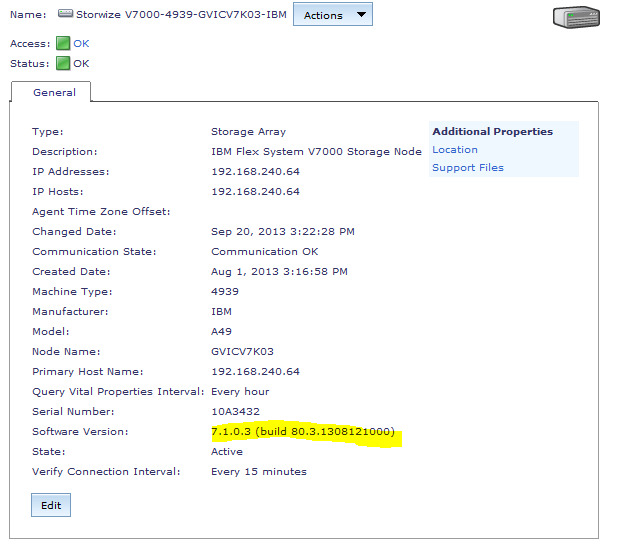 First go to your v7000 cluster GUI and go to Pools -> Internal Storage. Next physically add your drives to the v7000. Once the drives are added you should see the new drives, separated by drive type, and listed as ‘unused’. 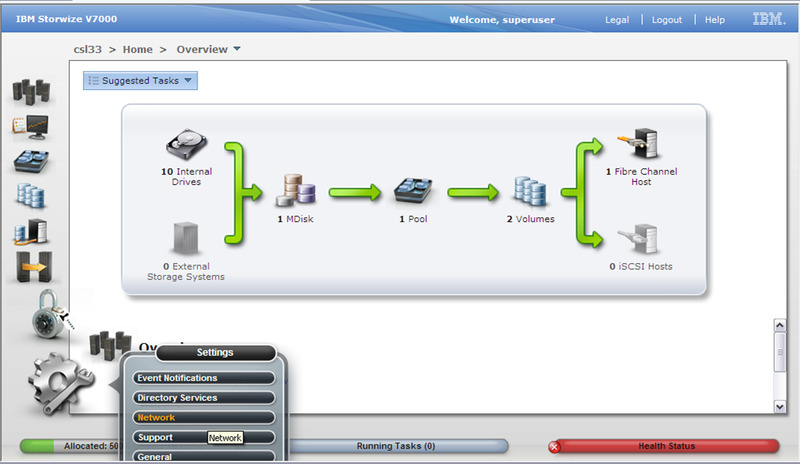 Now click the box on the upper left that says ‘Configure Storage’. Choose the RAID type you want and whether you would like to create hot spares. Allowing the IBM recommendations to be run is the best practice. Also, one hot spare per enclosure is enough to keep the recommended fault tolerance to the mdisk arrays. Once the job runs the wizard will ask you to either create a new pool or to add to an existing pool. 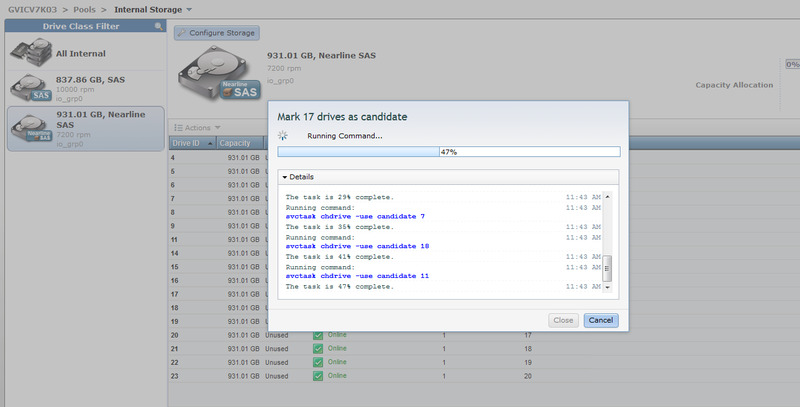 (For my configuration I added the 900GB 10k SAS drives to an existing pool and for the 1 TB 7.2k SAS drives I created a new pool with 2 mDisk arrays per IBMs recommendations). Once you have mDisk arrays and mDisk pools created you will be able to create vDisks or logical drives from them. NOTE: DO ONE SWITCH AT A TIME. The switch will need to reboot during the upgrade but as long as the other fabric aka SAN switch is online and healthy then this will not be a problem..
Verify in the confirmation screen that the information looks correct and click ‘Finish’. Watch the logs for errors. When the job completes, verify the SAN switch inventory reflects the new firmware. Next either run the job now or schedule it for a time during your maintaince window.